The Alli diet plan comes with the Alli Starter Pack that includes several books and guides on how to keep you motivated and losing weight. 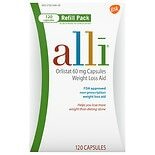 This diet plan along with Alli weight loss capsules themselves are available at Walgreens.com. Remember, diet supplements cannot do it all alone as you will need to adhere to the diet and exercise program laid out by the Alli diet program.